You should know better than to stumble through mysterious portals. Yet here you are, a stranger in a strange land made from the jumbled fragments of a hundred dead civilizations. And for better or worse, you are not alone. A war rages between strange factions, but all tremble before the giant creatures that stop across the land. Time to bring some balance to the world with a giant robotic fist! You’re a handy sort, exactly the type of person that can learn how to build giant robotic suits. So get exploring! Find the plans, find the parts, assemble the machines, and show the creatures in this strange world who’s the boss. - Build A ‘Bot: Learn how to create dozens of robotic Goliath suits from a variety of materials, including wood, stone, metal and more. - Survive A Savage Land: Gather materials to build the tools needed to survive, including healing salves, protective fortresses and more. - A Living World: Explore rolling prairies, dense forests, eerie swamps, frozen tundras and more, all with a complete day/night cycle and dynamic weather. - ---- Choose A Side: Several factions vie for control of resources and territory in the world of Goliath. 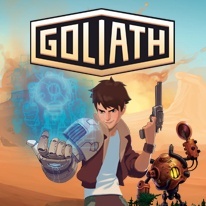 - Procedurally Generated World: With procedurally generated environments and quests, the world of Goliath is full of surprises!